First up in the blog this week, excerpts from the April 3, 1950 episode of the NBC morning talk show “Tex and Jinx”. There are not that many episodes that survive of the series and it’s a shame since the couple interviewed many celebrities during the run of the show. This episode features an interview with Manie Sacks. Sacks, not generally known to the public, was the head of Columbia records, befriending and developing artists such as Frank Sinatra and Harry James. He was also instrumental, through his friendships in the business, with prompting Jack Benny, Burns and Allen and Edgar Bergen to switch from NBC to CBS. You can read about Manie Sacks at this website; oddly, for his prominence at Columbia and later RCA, you’d think he’d have a Wikipedia page. 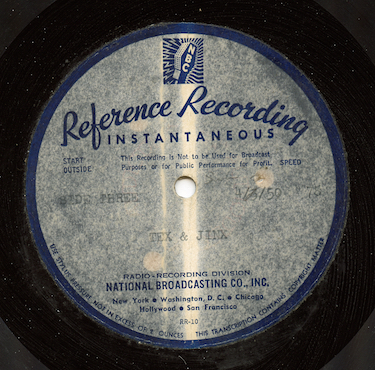 Our excerpts were transferred from a 12” NBC Reference lacquer recorded at 78 rpm. The excerpts are of parts three and six; the rest of the episode doesn’t survive. The network cue and NBC chimes are heard at the end. "Show Stoppers" is one of those obscure little programs that seems to have slipped through the cracks over the years. Sponsored by Koret of California, the series features guests who talk about their show-biz careers and the turning points in their lives that led to their success. Goldin lists several programs in the series with some interesting guest stars. Program 19 in the series features band leader and radio host Kay Kyser talking with host Knox Manning. Kay Kyser is best known to old time radio fans as the host of the "Kollege of Musical Knowledge" on NBC. But, here in North Carolina, he's remembered as a loyal alumnus of the University of North Carolina and one of the key figures that helped establish UNC's public television station. You can find an authorized biographical website at http://www.kaykyser.net/. Our mp3 originated from an NBC Orthacoustic transcription pressed for Textile Broadcasts, Inc, 846 S. Broadway, Los Angeles 14, California. The matrix number is HD6-MM-7306-1, which I think would put this disc being mastered in 1946.